CBP requirements in the USVI are unique because it operates under the Danish Public Law 64; a law that remains in effect since 1914, when Denmark sold the islands to the U.S.
U.S. Customs and Border Protection recently held an event at the Cyril E. King Airport to gather local feedback to incorporate the U.S. Virgin Islands into the Automated Commercial Environment, to expedite the importation process. 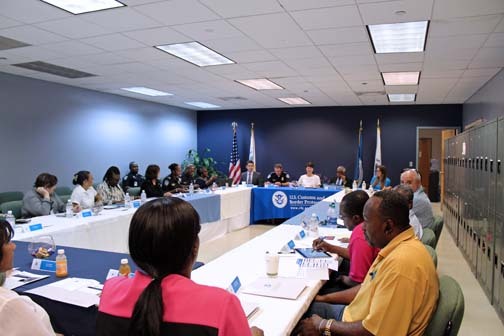 With the title “On the Path to Automation, Getting there together!,” the USVI trade community and CBP had an open dialogue regarding the challenges of using a manual paper-laden process, its impacts to commerce, and the initial steps taken by CBP to modernize this process through the introduction of electronic filing or automation. In 2016, the CBP San Juan Field Office started the process of gathering information on the longstanding system in which all custom entries are made by importers in person, on paper to the CBP entry branch in Charlotte Amalie. “Stakeholder input has been key to our ACE success. This input has been a critical component in defining the business requirements that have made up our ACE deployments, and will continue to be critical as we enter the next phase of ACE,” said Brenda Smith, executive assistant commissioner for Trade. “We look forward to the ongoing dialogue, including today’s discussion, to determine how we can integrate the needs of USVI processing into ACE,” she said. With a manual cargo clearance process, each CBP employee must retain and apply import laws and regulations based on a manual review upon receipt of clearance documents. “We need to make the trade entry process in the USVI more customer friendly,” stated Edward Ryan, assistant director of field operations for Trade in Puerto Rico and the USVI. Customs regulations require the advance electronic transmission of cargo information prior to arrival into the United States by sea or air. The first step in utilizing ACE for trade automation will be to test the carrier manifest component of ACE. This will involve the cooperation of select vessel carriers to send their advanced manifests through ACE for CBP VI review. Thereafter, this submission requirement will be implemented for all vessel carriers. This will bring vessel carriers in line with the Customs regulations, the agency said. Hey Buddy!, I found this information for you: "CBP gathers feedback on USVI trade automation process". Here is the website link: https://newsismybusiness.com/gathers-feedback-automation/. Thank you.